The text is an IPTEKS application of community service activities and innovative ideas in the implementation of community service that has not been or is not in the process of being published in other journals (reinforced by a statement). The manuscript is written in Indonesian and accompanied by a maximum of seven words. Maximum executive summary length is 500 words. Manuscript typed with MS Word word processor, Times New Roman letter, 12 pts size, space 1.0 with Upper-Bottom margin 2.5 cm, Left 3 cm, Right 2 cm and printed on A4 paper. The script length is a maximum of 10 pages. The systematic writing of the article (and its description) follows the following order. Written in Bahasa Indonesia, maximum 500 words. Contains urain of background, source of inspiration, method, masterpiece, review, conclusion, impact and benefits. Keywords maximum 7 words. Describe about: (1) The facts that inspire and become the focus of the implementation of PPM activities; can be a challenge of the PT, the problems or needs of small / medium enterprises, the community; (2) Existing condition of small / medium enterprise, community or PT resources; (3) Efforts that have been received by other parties to small / medium business, community or PT; and (4) the main purpose of the activity. The source of inspiration does not mean the partners or the PT itself, but rather the challenges, problems or needs of the PT, the business community or the actual community Describe the problems or basic needs of small / medium enterprises, communities, mutually agreed to be resolved or key challenges PT targeted activities . Describe techniques or how to solve challenges, issues or basic needs that become targets of joint activities or agreements. one or more of the following methods or combinations of methods may be selected: (1) Community Education. For activities a) training such as in-house training ; b) continuing education; c) scientific refresher training, d) counseling aimed at improving understanding (eg in law, religion, regulation) so as to awaken the community to the possibility of misunderstanding ; (2) Consultations For activities where the problems or needs of small / medium enterprises or communities are solved through consultation services with PT; (3) Science diffusion. For activities that produce products for both internal and external consumers of PT ; (4) Training. For activities involving a) counseling about the substance of the activity, followed by demonstrations to construct or realize it; b) train the operating system or equipment granted; c) or activities to form new entrepreneur groups, d) PT offering certified services to the public; (5) Mediation. For activities a) PPM implementers in their activities to position themselves as mediators or mediators of conflicting parties; b) or together communities solve problems that require the services of public or private institutions; (6) Simulation of Science. For activities in which the main work is information systems or the like, which aim to explain something that can not be done as physically or real; and (7) Science and Technology Substitution. For activities that offer new, more modern and efficient ipteks to small / medium-sized businesses, society by replacing the old mastery of ipteks. This chapter also includes data collection and analysis techniques. Describes about: (1) The advantages and disadvantages of that work mentioned in point D is synchronized with the conditions of small / medium businesses, communities or consumers; and (2) the degree of difficulty in its implementation or manufacture and of opportunities for its problems. (1) Prabowo GJ, Priyanto E. New drugs for acute respiratory distress syndrome due to avian virus. N Ind J Med. 2005; 337: 435-9. (2) Feinberg TE, Farah MJ, editors. Behavioral Neurology and Neuropsychology . Ed ke2. New York: McGraw-Hill; 1997. (3) Morse SS. Factors in the emergence of infectious disease. Emerg Infect Dis [serial online] 1995 Jan-Mar; 1 (1): [24 screens]. Availablefrom: URL: http://www.cdc.gov/ncidoc/EID/eid.htm. Accessed December 25, 1999. Delivery of acknowledgments to the parties that play the most role in helping the smoothness of activities, for example, funders, PT partners, district or city government, lead PT. Tables and pictures are numbered and titled. Images must be original and clear and are one with the script file (not the patch). Graphics and photographs will be printed in black and white format, except at the author's request with the cost of printing costs borne by the author. All manuscripts are reviewed anonymously by expert reviewers according to their field of expertise. The author makes revisions based on input from expert editors. Authors whose articles are published shall pay a fee contribution of US$20 per article. 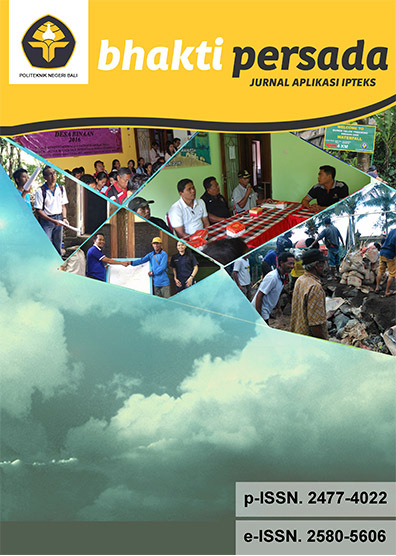 In return, the authors received 2 (two) copies of BHAKTI PERSADA magazine containing the author's articles. Articles not loaded will not be refunded, except at the author's request.